« Postage for Email? My Internet != Your Internet? Virtual Click Wheel for iPod? Widescreen?!?! The biggest complaint about the video iPod is the small screen size. If Apple made the iPod screen bigger, the iPod would be bigger, and use more battery life, two bad things. This touchpad patent looks like the cure to one of these problems. 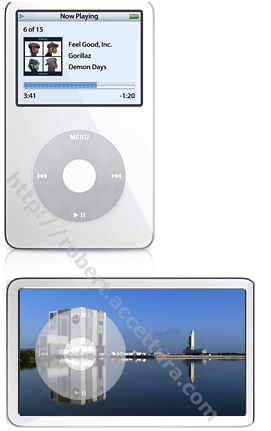 It would let apple make the entire front of the iPod a display. Similar to what Palm did by getting rid of the graffiti area and making it virtual. Their’s the “ooh” factor that’s sure to sell, and the larger screen. Apple could even take a hint from Palm and design it so that the press of a “button” (likely something on that screen rather than a physical button) would make it show video in landscape mode (read: wide screen). This article seems to hint it’s targeted more at tablet PC’s (which have been rumored for a few years now). Personally, I’m thinking a widescreen iPod is more likely. iPod photo copyright Apple Computer Inc. Modified (poorly) by Robert Accettura. Anyone else think this is a distinct possibility? The significant drawback to that idea would be loss of tactile feedback from pushing buttons. I can see the video ipod going that route in a year or two with the Nano just scaling up capacity for those who just want audio and like the tactile feedback.